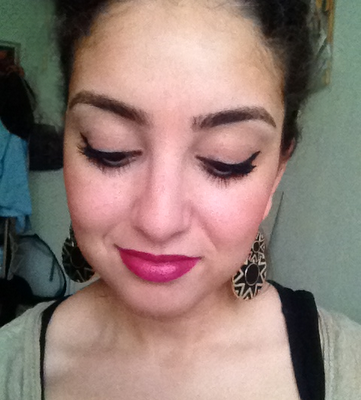 My exams are over and that means new blogposts! I've been looking forward to this a while. I'm such an addict: during my exam week I was taking pictures of new blogposts I was going to write later on. Behold, the result! 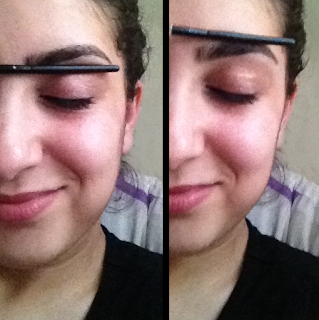 This time I'm showing you how I do my eyebrows. These are the tools I'm using. Tweezerman tweezers, something to comb my eyebrows with and a pair of scissors. 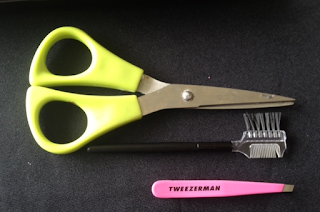 I've tried so many tweezers, but Tweezerman is definitely the best! You can choose for little scissors as well, but for me this works best. My eyebrows before I've done them. I've neglected them for a while, as you can see. Originally I have very VERY thick eyebrows. I pluck A LOT. You can't really see it here, but my brows start halfway my eyelid and they end somewhere on my forehead. It's a blessing but a curse as well. I try to keep up with my eyebrows regularly, so I don't have a lot of work to do. Once a month or two months I do my eyebrows extended. In that case it takes me two (!!) hours to do them. Haha don't mind my puffy face without makeup and with frizzy hair. I just woke up and I got inspired immediately. Before plucking, I take these basic steps. First clean your face and comb your eyebrows. I prefer to comb them up. 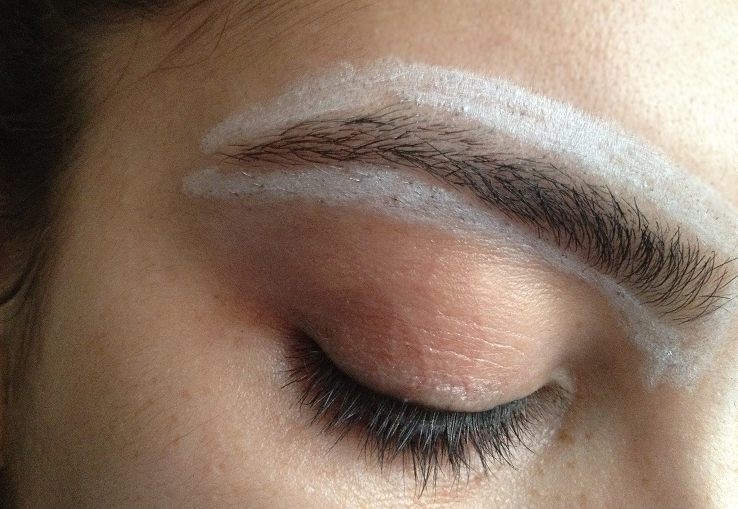 Then take something you can use to form guidelines for your eyebrows. Put your pencil/brush/whatever against your nostril and let it connect with the inner corner of your eye. This is where your eyebrow starts. Your eyebrow ends where your nostril and outer corner of your eye connect. To find your arch, put the pencil against your nostril again and let it connect with the end of your iris. To make it easier for yourself you can mark these guidelines with a white eye pencil. 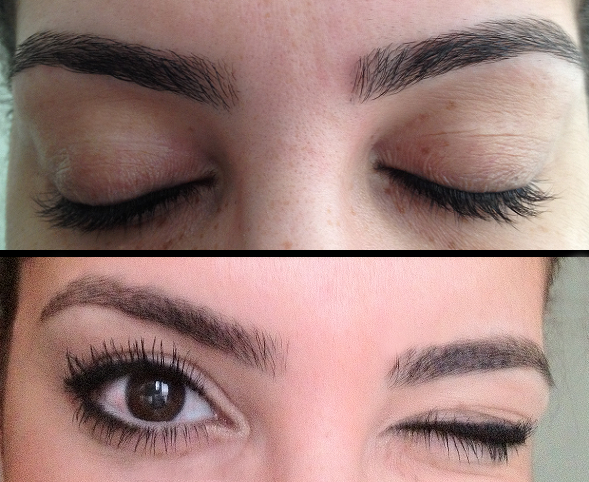 Make sure the start and the end of your eyebrows are parallel to each other. Drawing a line with white eyepencil is something I always do when I do someone else's eyebrows, but what I don't do everytime I do my own brows. When I have much to pluck, I'm afraid to lose my shape. Anyway, determine your shape with a white pencil. I stay as close as possible to the original shape of your eyebrow. Then I draw a guideline around the eyebrows to know what hairs to remove. 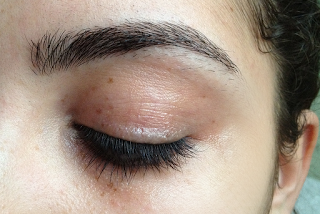 After plucking, clean the white eyepencil of your face and remove any hairs that are left behind. By drawing the shape with a white eyepencil, you prevent overplucking and you have determined a shape for yourself. This way you can outline how they will turn out. At last, after plucking and cleaning the eyebrow area, you finish your eyebrows by trimming them. I tried to take a picture, but it was plain impossible. With the little comb you have, comb your hairs up, without removing the comb. So you keep the hairs straight up with the comb. This makes trimming easier. By holding the hairs with your comb, you can trim them at the right length, without the hairs falling down. This way it's easier to cut them in the same length. 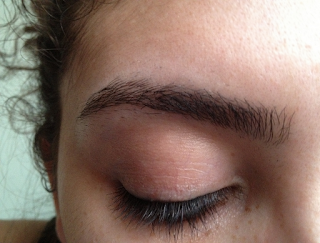 By the way, I've heard it a lot: don't pluck the upperside of your eyebrows, because then it looks less natural. Oh come on, since when are eyebrows looking natural these days! Besides, I like it when eyebrows look neat, smooth and tight. Aaaand, I know it doesn't sound logical, but when you pluck the upper side of your eyebrows, your eyebrows actually look neater, thicker and fuller. And that's it! It takes about 10-30 minutes of your time. 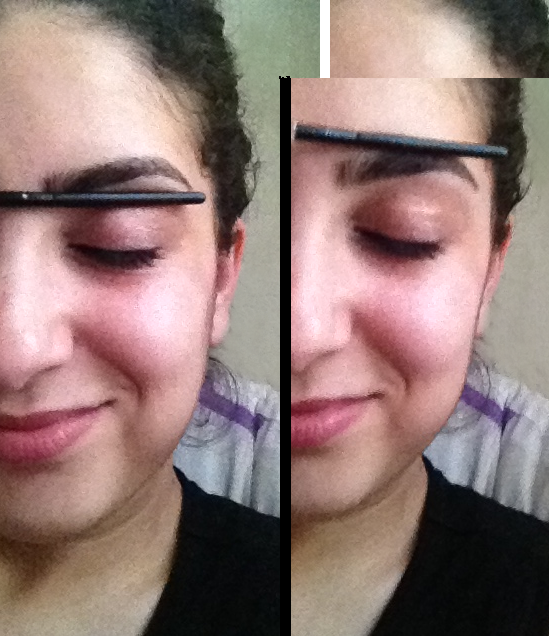 When I give myself an all inclusive eyebrow turn, I wax the area around my eyebrows as well. I like my eyebrows tight and clean. This includes waxing my forehead a little. I don't fill in my eyebrows. I have done it a few times, just to try it. It looked hor-ri-ble. It's just too much with my thick hairs. A full face shot with my eyebrows done. Hope you enjoyed my little tutorial! You have gorgeous eyebrows, I love them. This is perfect :) I definetly will need to work on doing it by myself ^^ Thanks for sharing ! fantastic, nice and neat, love them! Woah you've got some gorgeous full brows ! I never thought of outlining my brows with white pencil before doing them, that's a really good idea I'm def gonna try it out. Your eyebrows seriously look amazing! 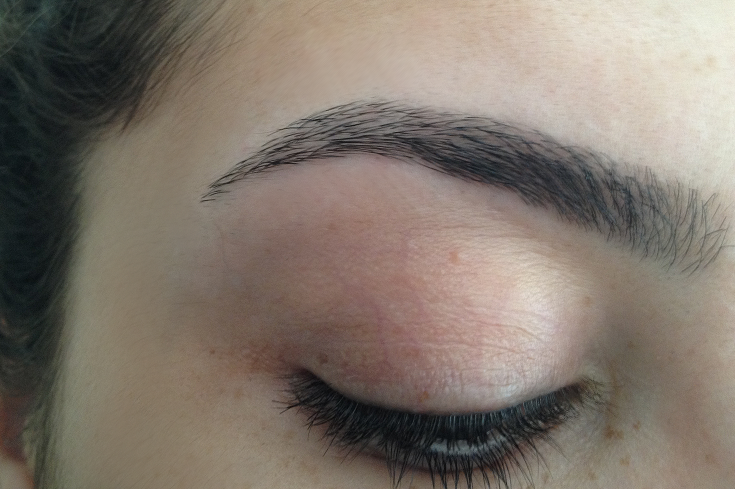 I love full brows- I get nervous to get mine waxed out of fear that they will be overwaxed and become too thin!! 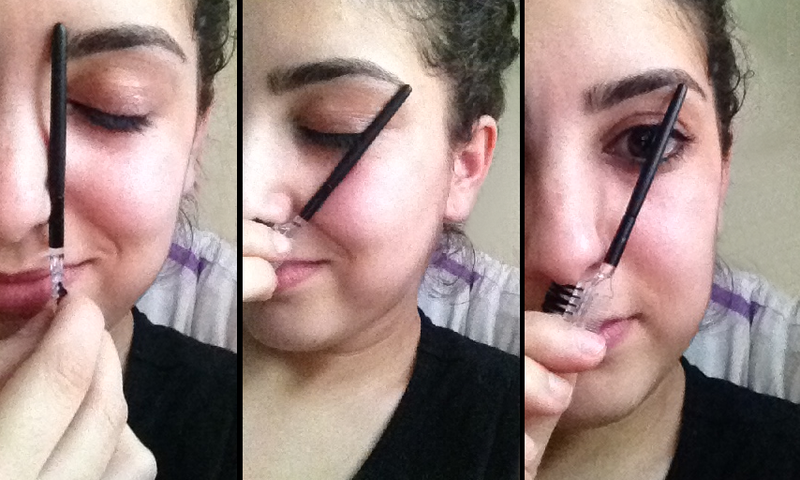 Seriously the best brow tutorial ever! Love the tip with the white pencil, would've never thought to do that. And of course Im in love with the shape of your brows! You're so pretty Sal and your eyebrows look amazing! Great tutorial as always!